Hearts of the Dulcimer is a feature-length film about the counterculture and a passion for an often-misunderstood instrument. The mountain dulcimer often conjures up rustic mountain life and simple traditional music from the American South in a bygone era. But that’s not the whole story. From a group of countercultural youth living in the Santa Cruz Mountains in the late ‘60s to Joni Mitchell's influential Blue album in the early ‘70s, the mountain dulcimer found a new voice in a "new land": California. This newly released documentary doesn't hit you over the head with obscure facts. Instead, Hearts of the Dulcimer takes you on a heartfelt journey--both musically and narratively--inviting you to see this musical instrument in ways you might not have imagined. In the late 1800s, dulcimer builders and players living in the Appalachian Mountains were attracted to this rustic instrument's do-it-yourself spirit. They found freedom of expression in the dulcimer; there were no written rules on how it should be built or played. This same DIY spirit captured the imagination of 1960s countercultural youth in California. They discovered this same freedom, and created new musical and art forms with this simple mountain instrument. Buy the Hearts of the Dulcimer DVD. Famous artist lends support to Pacifica filmmakers. Pacifica Tribune (October 13, 2015). 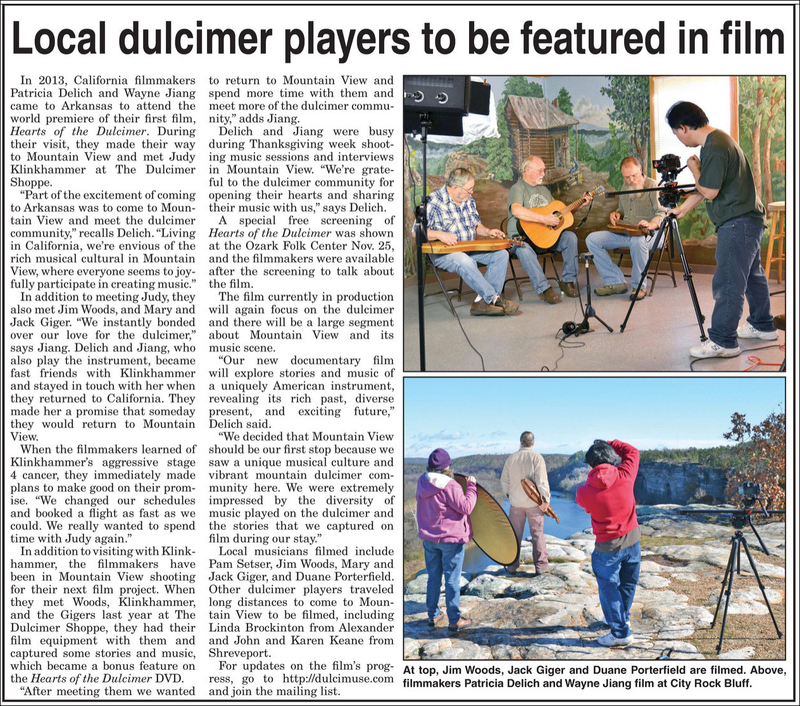 Local dulcimer players to be featured in film. Stone County Leader (December 10, 2014). 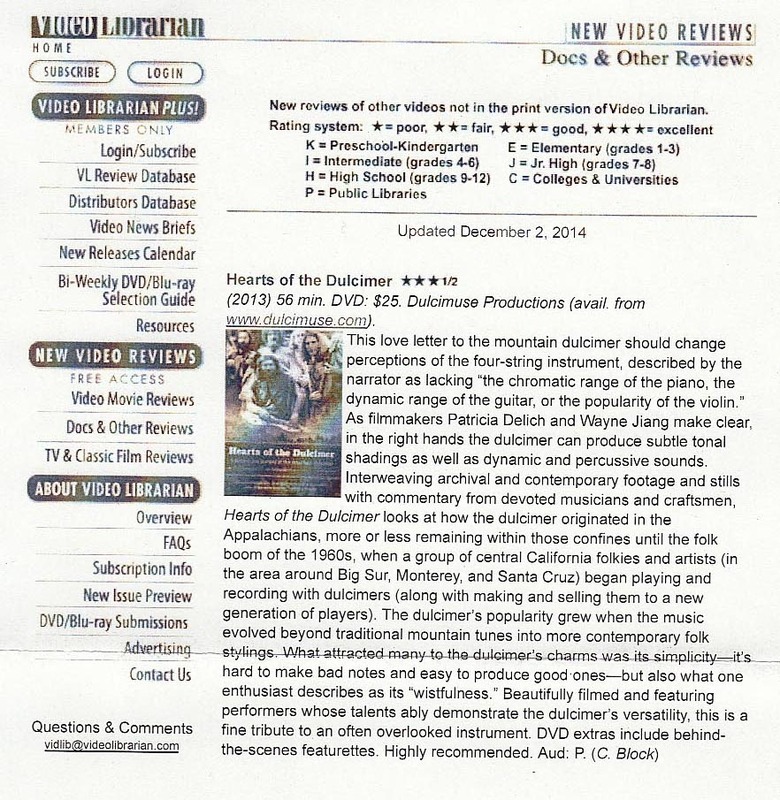 The publication Video Librarian review of Hearts of the Dulcimer (December 2, 2014). 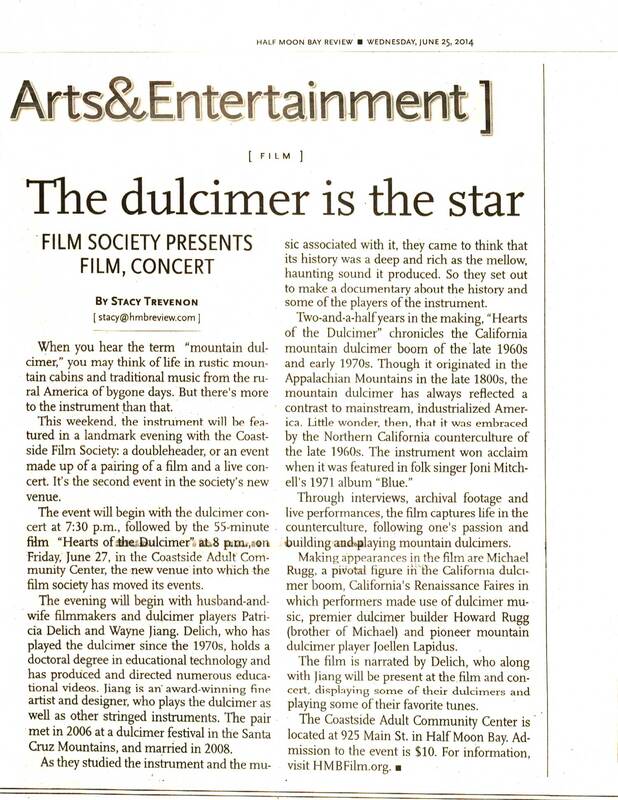 Hearts of the Dulcimer is featured in the latest issue of Dulcimer Players News (Volume 40, Number 3, Summer 2014). This issue can be purchased on their website for $10 (the article is not available online). Douglas library to host documentary film on the mountain dulcimer. Juneau Empire (September 11, 2014). Screening of Hearts of the Dulcimer highlights Redwood Dulcimer Days. Santa Cruz Sentinel (August 6, 2014). The dulcimer is the star! Half Moon Bay Review (June 25, 2014). Hearts of the Dulcimer -- a film by two Pacificans. Coastal Connections (Dec. 2013). Want to share your thoughts about the trailer or these excerpts? We'd love to hear what you think! If you're on Facebook, join our conversation there. If you're not on Facebook, send us a message.